My second chocolate almond croissant this week. It’s Saturday, and therefore time once again to look back on three beautiful things from the past week. 1. On Monday, I got a letter at work – an actual handwritten note – full of thanks and praise and kind words about a presentation I gave at a conference earlier in the month. It absolutely made my day! 2. On Wednesday night, in a stressful, nail-biter of a game, the Caps proved all of the hockey pundits wrong and advanced to the next round of the playoffs after eliminating the reigning Stanley Cup champs. After an up-and-down season, postseason success is extra-exciting. 3. I stopped at a different breakfast/coffee spot on Thursday and discovered something I never knew existed: chocolate almond croissants. 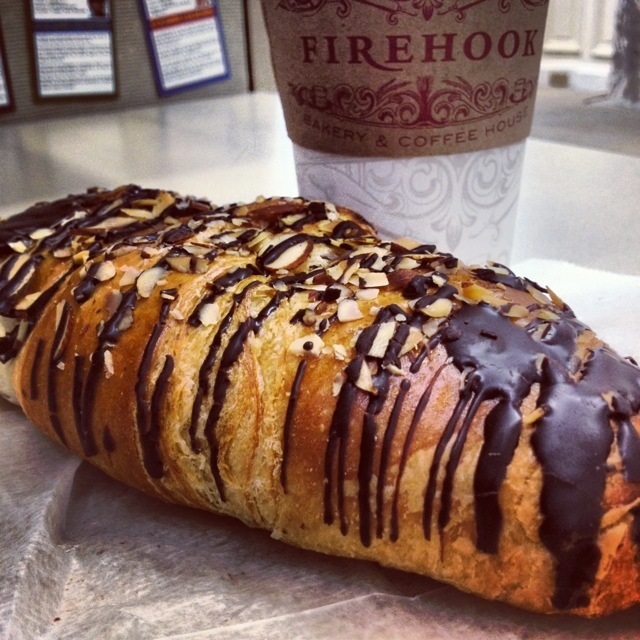 I love both chocolate croissants and almond croissants and finding out that someone combines the two… life changing! As in, I’ve found the breakfast that will make me fat. That croissant looks AWESOME. yum yum! !